Direct channel is the most cost effective and reliable means of selling inventory to guests, especially since it does not have intermediaries. 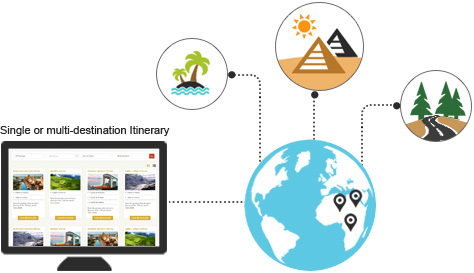 ResAvenue Direct Connect equips hotels with a responsive booking engine and an advanced booking solution for packages and stay enrichments, transforming it into a real-time sales engine. ResAvenue also offers other multiple ways to sell direct, through your hotel's branded pages on social media, electronic invoice payments, ResAvenue PhonePay (IVR) and attractive discounts and promotions. Your website booking engine provides you with the best opportunity for direct sales. 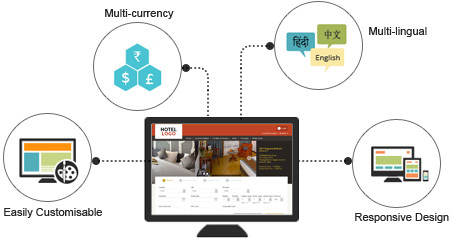 Convert your website into a powerful direct sales engine by integrating our ResAvenue Hotel Booking Engine. Choose from our wide range of intuitive, elegant and responsive booking engine templates to match your business needs and provide your guests with a personalized and pleasurable booking experience. ResAvenue CRS along with the booking engine offer power packed features for you to effectively drive direct sales from your own website. If you've joined the ranks of marketing-savvy hoteliers who offer packages to their guests, the ResAvenue Packages Booking engine is just right for you. Generate new revenue streams by creating well-crafted packages for leisure travelers that combine the costs of overnight accommodations with value added stay enrichments and adventure activities they want to enjoy in the vicinity. Convenience for your guest, and an excellent marketing opportunity for you! ResAvenue Packages Booking Engine helps you create attractive, value added, customized packages for one or multiple destinations. Give your customers' value beyond their imagination! Hoteliers are increasingly aware of the need to maximize yield by upselling value added services, activities and add-ons as standalone purchases separate from the room bookings. 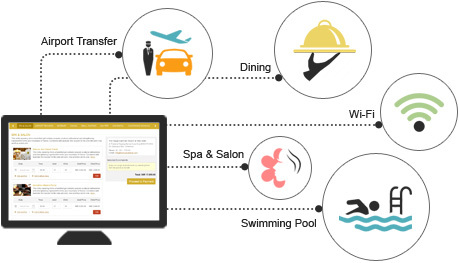 ResAvenue Stay Enrichment Booking Engine helps you increase your hotel's revenue by booking conference and banquet halls as well as selling catering services, gymnasium, swimming pool and spa memberships or services directly from your hotel website. Harness the power of web 2.0 and social media to generate direct sales through Facebook, Twitter and Google+. Use social media not just to engage your customers but also to promote and sell your hotel rooms and products. 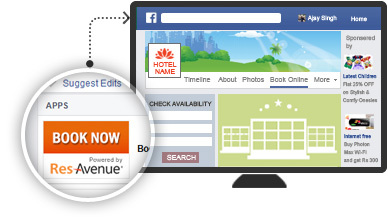 Sell rooms directly to your Facebook fans without them having to leave your branded Facebook page using the ResAvenue Facebook Booking engine. Highlight and promote offers and promotions, packages and stay enrichments and drive sales directly from your fan page. 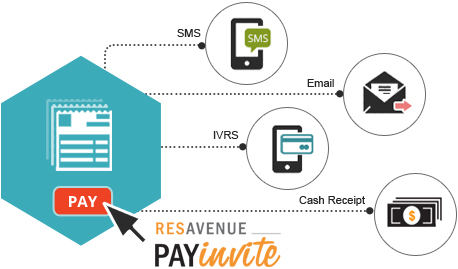 Convert leads into a qualified sale quickly using the ResAvenue PayInvite. It's faster, safer and most convenient. PayInvite is a proactive and professional way to get paid. Your customers with email addresses can receive the PayInvite from you, with description of services or with list of rooms kept on hold. You can even send the PayInvite by SMS / IVR or create simple bulk invoices. It's just one click for them to pay by card or bank account. Switch to a faster, simplified and streamlined way to invoice. Block and sell rooms through time bound invoices. Close your sale on the phone! Convert calls coming in to your front office, reservation desk or reservation call center into a confirmed sale using ResAvenue PhonePay. Receive money instantly and securely over the telephone with our enterprise-level secure IVR (Interactive Voice Response System) without any equipment, programming or recurring maintenance costs. Add value, attract attention and stimulate sales. From simple discounts for a defined period to long stay, early or last minute bookings, value added stay enrichments; ResAvenue makes it all possible. Offer promotions that your customers just cannot resist! Boost sales by offering discounts and coupons. 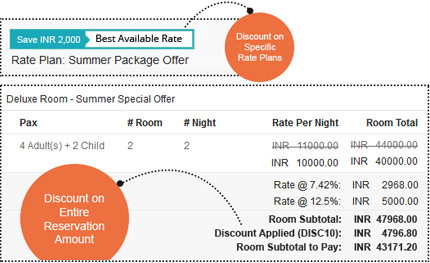 Specify the dates for which the code is valid, create discounts applicable only for specific rate plans or define a coupon to give discount on the entire reservation amount.